Product prices and availability are accurate as of 2019-04-14 03:12:57 EDT and are subject to change. Any price and availability information displayed on http://www.amazon.com/ at the time of purchase will apply to the purchase of this product. 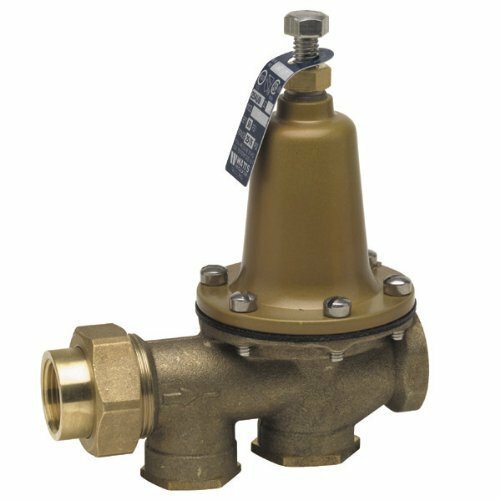 A Water Pressure Reducing Valve with integral strainer shall be installed in the water service pipe near its entrance to the building where supply main pressure exceeds 60psi (413 kPa) to reduce it to 50psi (345 kPa) or lower. The water pressure reducing valve shall be constructed using Lead Free* materials. Lead Free* regulators shall comply with state codes and standards, where applicable, requiring reduced lead content. The valve shall feature a Lead Free* brass body suitable for water sup- ply pressures up to 300psi (20.7 bar). Provision shall be made to permit the bypass flow of water back through the valve into the main when pressures, due to thermal expansion on the outlet side of the valve, exceed the pressure in the main supply. Water Pressure Reducing Valve with built-in bypass check valves will be acceptable. Approved valve shall be listed to ASSE 1003 and IAPMO and certified to CSA B356. Valve shall be a Watts Series LF25AUB-Z3. ** Series LF25AUB-Z3 Lead Free* Water Pressure Reducing Valves are used in commercial and residential applications to reduce incoming water pressure for protection of plumbing system components and to reduce water consumption. It consists of a Lead Free* copper silicon alloy body construction, union inlet connection, integral stainless steel strainer and high temperature resistant reinforced diaphragm for hot water. The Series LF25AUB-Z3 is available with a variety of end connections including: threaded, solder, PEX, quick-connect and CPVC with both union and double union connections. Series LF25AUB-Z3 has an adjustable pressure range and is serviceable in-line. Maximum Working Pressure: 300psi (21 bar), Adjustable Reduced Pressure Range: 25 to 75psi (172 to 517 kPa), Standard Pressure Setting: 50psi (344kPa).